161. The node or joint of the stem marks a definite point of a peculiar organization where the leaf with its axillary bud arises. The nodes occur at regular intervals, and the spaces between them are termed in-ternodes. This provides for the symmetrical arrangement of the leaves and branches of the stem. In the root no such provision is made, and the branches have no manner of arrangement. 162. Why the stem gradually diminishes upwards. In the in-ternodcs the fibres 'composing the stem are parallel, but at the nodes this order is interrupted in consequence of some of the inner fibres from below turning outwards into the leafstalk, causing more or less a jointed appearance. Hence each internode contains fewer fibres than those below it. 163. How the stem grows. The growth of the stem consists in the development of the internodes. In the bud the nodes are closely crowded together, with no perceptible internodes, thus bringing the rudimentary leaves in close contact with each other. But in the stem, which is afterwards evolved from that bud, we see full grown leaves separated by considerable spaces. That is, while leaves are developed from the rudiments, internodes are evolved from the growing point. 164. But there are exceptions here as to all other rules in science, adding another element of diversity to the endless gradation of form in Nature's works. In many plants the axis of the primary bud does not develop into internodes at all, or but partially in various degrees, as in the Trillium, Crocus, blood-root. Such stems seldom appear above ground, and are said to be subterranean. 165. 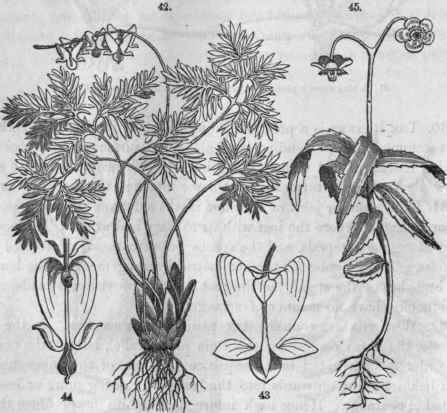 This fact makes a wide difference in the forms of stems, and naturally constitutes them into two great divisions, viz., the leaf-stem and the scale-stem. 166. The leaf-stems are those forms which, with internodes fully developed, arise into the air crowned with leaves. The principal forms are the caulis, culm, trunk, caudex, vine. 167. The scale-stems arc those forms which, with internodes partially or not at all developed, and generally bearing scales, which are undeveloped leaves, scarcely emerge from beneath the soil. They are the creeper and rhizoma (developed), the crown, tuber, corm and bulb (undeveloped). 42. Scale-stem, (Dicentra cucnllaria). 43, A flower of the same. 44, A flower of D. Canadensis. 168. The leaf-stems are either herbaceous or woody. The herbaceous, whether arising from annual, biennial or perennial roots, bear fruit but one season and then perish at least down to the root, scarcely becoming woody; as the (1) mustard, (2) radish, and the % grasses. The woody leaf-stems survive the winter, and become firm and solid in texture in after years. 169. Caulis is a term generally applied to the annual leaf-stems of herbaceous plants. " Halm" is a term used in England with the same signification. Caulescent and acaulescent are convenient terms denot-ing, the former the presence, and the latter the absence of the caulis or aerial stem. 170. The Culm is the stem of the grasses and the sedges, generally jointed, often hollow, rarely becoming woody, as in cane and bamboo. 171. The trunk is the name of the peculiar stems of arborescent plants. It is the central column or axis which supports their branching tops and withstands the assaults of the wind by means of the great firmness and strength of the woody or ligneous tissue with which it abounds. 172. Various forms. The trunk is usually seen simple and columnar below, for a certain space, then variously dividing itself into branches. Here it is cylindrical, straight and erect, as in the forest pine; prismatic often, as in the gum-tree; gnarled and curved, as in the oak; or inclined far over its base, as in the sycamore. 173. In dividing itself into branches we observe two general modes, with their numerous variations, strikingly characterizing the true forms. 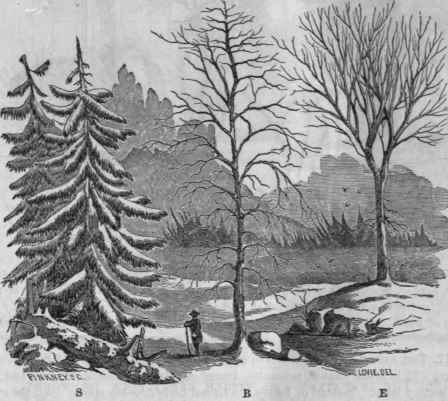 In the one, named by Lindley the excurrent, the trunk, from the superior vigor of its terminal bud, takes precedence of the branches, and runs through to the summit, as in the beech, birch, oak, and especially in the spruce - trees with oval or pyramidal crowns. 114 But in the other, the solvent axis, as seen in the elm, the apple-tree, the trunk suddenly divides into several subequal branches, which thence depart with different degrees of divergency, giving the urn form to the elm, the rounded form to the apple-tree, the depressed form to the sloe-tree (Viburnum) and dogwood. 175. The form of the trunk sometimes changes with age, especially in tropical regions, some distorted by huge local excrescences, others swelling out in the midst to "aldermanic" proportions. 47. a, An old willow (Salix Babylonica) with gnarled and misshapen trunk. b, Caudex of a cactus (Echinocactus Ottonis). c, Bombax, of Brazilian forests, with distended trunk. (1, Palmetto (Sabal, Adns), the caudex rough with the persistent bases of the petioles. 176. 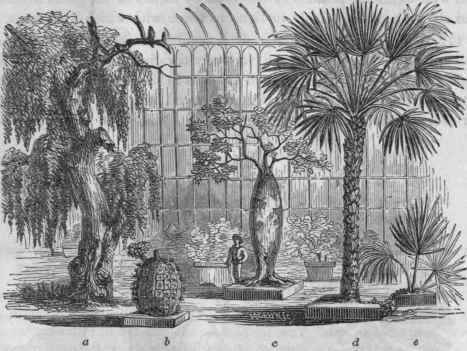 Caudex is a term now applied to the peculiar trunk of the palms and tree-ferns, simple, branchless columns, or rarely dividing in advanced age. It is produced by the growth of the terminal bud alone, and its sides are marked by the scars of the fallen leaf-stalks of former years, or are yet covered by their persistent bases. 177. The stock or caudex of the cactus tribe is extraordinary in form and substance. It is often jointed, prismatic, branched, always greenish, fleshy, and full of a watery juice. Instead of leaves, its lateral buds develop spines only, the stem itself performing the functions of leaves. These plants abound in the warm regions of tropical America, and afford a cooling, acid beverage to the thirsty traveler when springs dry up under the torrid sun.